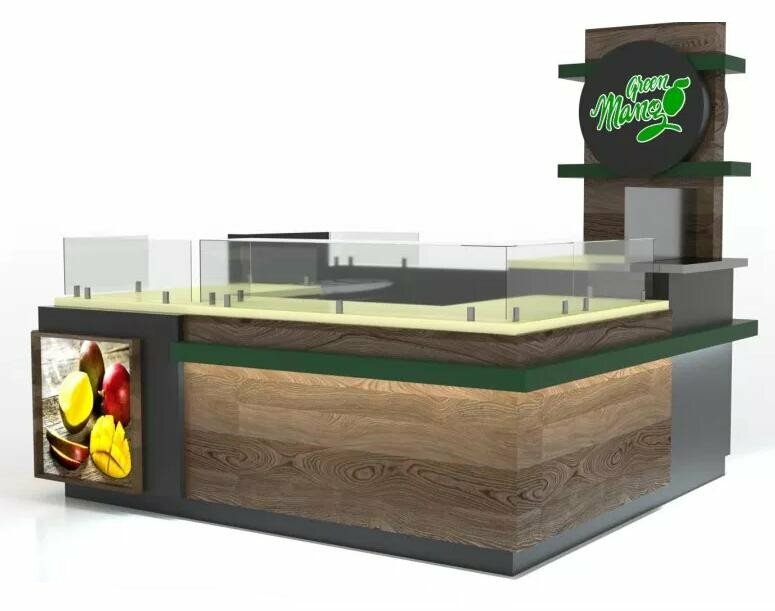 When you hang out at the mall or chatting, do you want to have fresh juice? 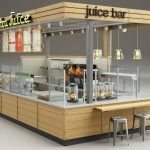 in 2019, Fruit juice service is very popular in many shopping centers, it’s very healthy and fresh. A variety of flavors to choose from. so that many guests love it very much. 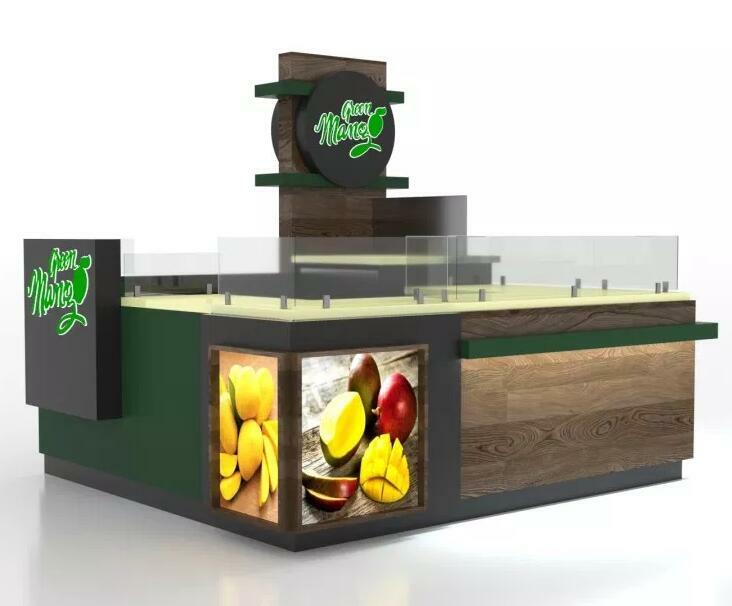 In this article what I wanna share is a very nice fresh fruit juice kiosk with Mango display kiosk for sale. You can see the whole kiosk tone is very Modern and Full of vitality. 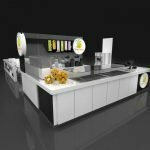 the main color is grey, match some original wood grain and green color strip decoration, the total is a square shape, mainly material is plywood, the surface is the wooden cabinet and beige color Corian countertop. You can see the whole kiosk countertop part with a 300mm heigh glass baffle. 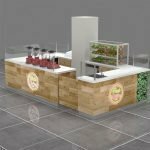 This provides a good barrier and isolation.here can put some juice machine, fruit display, and a small sink. the worker can be making juice and rinse inside. you can see the whole green color strip bottom is hidden led light strip. the whole kiosk bottom is a gray color laminate. The back sides are high signs. it’s a double acrylic logo display. 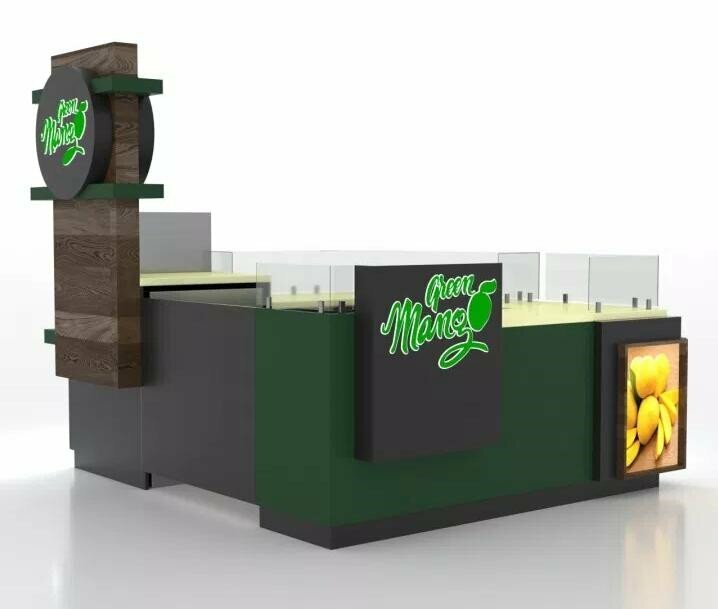 the front part is a lightbox for mango display. the right sides is an acrylic logo and lightbox decoration. looks very nice. Color: grey, green, wood grain. 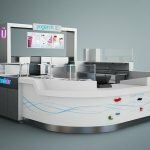 Thanks for your time and reading, Unique kiosk as a direct supplier, we mainly work on the design and customize different types of retail food kiosk and juice kiosk. if you’re interested to start your own food business or further info, welcome inquiry.